Feb 28 | "The Sounds of Blackness: Space and Sound Preservation as Oral History Advocacy"
Oral historians have suggested that sight and sound are essential tools in crafting the memory landscape. As gentrification moves swiftly through black communities, documentation of these inmaterial notions become ever more imperative for the preservation of black or formerly black spaces. Dr. Frazier will lecture on the theoretical underpinnings of sound/space oral history and how this intangible concept finds application in the national gentrification project, a year long effort to document and preserve these disappearing communities. 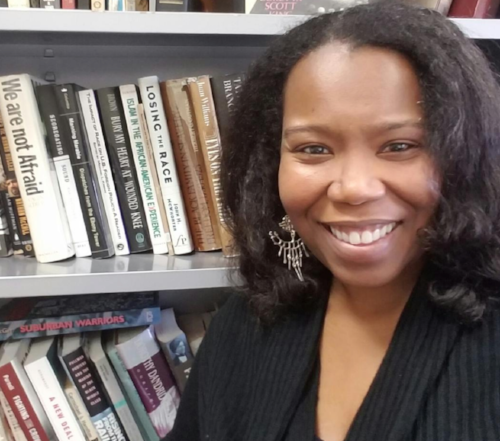 Nishani Frazier is Associate Professor of History at Miami University of Ohio. Prior to Miami University, she held positions as Associate Curator of African American History and Archives at Western Reserve Historical Society (WRHS), Assistant to the Director of the Martin Luther King, Jr. Archives at the Martin Luther King Center for Nonviolent Social Change, and personal assistant for Dr. John Hope Franklin, before and during his tenure as chair of President Bill Clinton's advisory board on "One America". Frazier's public history work incorporated oral history at its center including: interviews for Anacostia's Black Mosaic Project, WRHS's black veteran project, King Archives and Library civil rights activist programs, and community training sessions in oral history. Her research interests include 1960s freedom movements, oral history, food, digital humanities, and black economic development. Nishani’s recent book publication, Harambee City: The Congress of Racial Equality in Cleveland and the Rise of Black Power Populism, was released with an accompanying website also titled Harambee City. Harambee City website emanated from an original proposal for an accompanying oral history interview cd. Eventually, the audio supplement transformed into a comprehensive digital project that creates a second layer of book “reading” via online access to maps, archival documents, teacher lesson plans, and oral history interviews. Dr. Frazier has also consulted on several digital history grants which utilized oral history, including a NEH Digital Start up grant for an interactive app related to Freedom Summer. Frazier’s writings include: “To Die For the People: Prophecy and Death in the Rhetoric of Martin Luther King, Malcolm X, and Fred Hampton" in Homegoings, Crossings, and Passings: Life and Death in the African Diaspora; "Building a Black Nation: CORE, Black Power, and the Community Development Corporation Movement” in The New Black History; and “A McDonald’s That Reflects the Soul of a People: McDonald’s Corporation, Operation Black Unity, Hough Area Development Corporation, and Black Economic Empowerment” in The Business of Black Power. Click here to watch this talk!